» Articles » Sharp Tips » When Can I Cut Back Leaves Of Daffodils And Tulips? When Can I Cut Back Leaves Of Daffodils And Tulips? When the blooms of tulips and daffodils are at their peak, your spring garden boldly proclaims the brightness and brilliance of stunning colors that are ushering in the promise of a grand growing season. But when the blooms begin to fade, your garden starts looking a little dull. The blossoms are on the way out while the remaining leaves of the flowers are still standing. And, over a period of time, these leaves will slowly turn brown and wither away. We know the green foliage needs to remain on the plants for a time (from a couple of weeks up to a couple of months) in order to carry out the photosynthetic activity necessary to make and store food back into the underground bulbs. The stalks on which the blooms appeared are not necessary, however, in order for the plants to make food. So, go ahead and cut the bloom stalks back to the ground after the blooms are spent. This will help prevent the plant from using unnecessary food to convert the fading blossoms into seed pods. 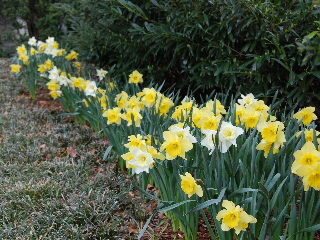 The leaves of the daffodils are not so difficult to manage since they tend to be rather long and flexible. Gather up the leaves of each plant and tie them together into neat bunches with green-colored twist ties. Pull the clumps of foliage backward into your garden area (away from your primary line of vision) and allow the bunches to lie as flat on the ground as you can. Tulip foliage is more difficult to deal with since the leaves are wider and more individualistic on each plant. Cut off the bloom stalk and allow the foliage to remain standing. You can soften the visual blow of the browning tulip and daffodil foliage by cleaning up the surrounding garden area and adding a fresh layer of mulch. Also, start adding blooming annuals to the area of your garden in front of the fading bulbs as soon as the weather permits. The longer you leave the fading foliage in place, the more food will be put back into the bulbs. I allow the daffodil foliage to remain in the garden until it is completely brown and dry. It can then be gently pulled away from the surface of the ground and removed. I cut back the tulip foliage as soon as it begins to brown. One way to avoid having to deal with the visual unpleasantness of the dying foliage of daffodils and tulips is to dig up and remove the bulbs from your garden after they finish blooming. Store the bulbs in a cool dry place through the summer months and then plant them again in the fall while adding lots of bulb food into your planting bed. Or, if your budget allows, buy new bulbs each fall to replace or to supplement the previous year's crop of daffodils and tulips.